Why Business Litigation Is Not Like "Law and Order"
There are a multitude of reasons people want to sue others, such as money owed, damage to your property or your business reputation, or because of some sort of accident, among others. Before you decide to take someone to court, there are some basic facts about civil litigation you should know. In general, what you see on TV law shows like Law and Order is criminal law, and what happens in a criminal case is not the same as the typical small business involvement in a civil case. Civil litigation is between two parties in which one party is claimed to have injured another, and it's the kind of litigation most businesses will be involved in. Criminal law is the government prosecuting a crime against society. In civil law, the burden of proof changes from "reasonable doubt" to "preponderance of evidence," which is less onerous on the plaintiff. In civil lawsuits, the preponderance of evidence means that evidence is not weighed on the amount of evidence, but on how accurate and convincing the evidence presented by each party is. Civil litigation isn't always in front of a jury, as in criminal cases. 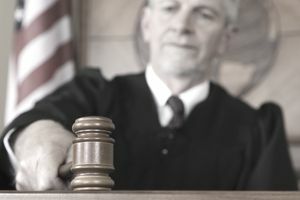 A bench trial in front of a judge is common. This changes the dynamic of the situation drastically. Breach of contract cases, in which two parties had an agreement which one party doesn't abide by. Just as you have seen happen on TV law shows like Law and Order, you may think you have a slam dunk, only to find that you get a judge who disagrees. A good litigation attorney can make or break a case. Every case is different, even if it's the same type of case. In civil lawsuits, particularly in Small Claims Court, you can get a judgment by the Court for money owed you, but you may have great difficulty collecting the money. There are ways the Court can put pressure on the payee, with garnishment or a lien against the property. In these cases, you must be proactive in getting the court to use its power in any legal means necessary to get someone to pay, But, as they say, "you can't get blood from a turnip." Many times on a TV law show, the defendant is trying to make a point or advocating a cause, but they ignore the key point that they committed murder. Don't get hung up on the small stuff; it's not a "matter of principle," it's a matter of the facts of the case. Listen to your attorney and follow his/her advice. Do you want to win the case or make your point? You usually don't get to do both. Unless you are going to Small Claims Court without an attorney, if you are taking this case to court to save money or get a big payoff, it won't happen. A good example is taking a non-compete agreement case to court. After many months, perhaps years, of litigation on whether the non-compete is reasonable and whether the other party breached your non-compete agreement, the only people who win are the attorneys. There are several ways of paying an attorney. You may have an attorney or law firm on retainer, so you can call them for different kinds of questions. But if there's a lawsuit, the attorney may want additional money to represent you. Many business cases involve fraud, but the list of steps to proving fraud is lengthy, and each one must be proved. Reasonable doubt doesn't apply here (that's for criminal cases like those on TV law shows) but, imagine trying to prove that someone knew that their statements were false. How do you prove that? Like the cases you see on TV law shows, the parties don't want to go to court—too expensive and too risky (see #2). In insurance-related cases, in particular, the attorneys (one of whom probably works for an insurance company) often reach an agreement just before trial, when they have the most leverage. If the case relates to insurance, the insurance company will do everything it can to keep the case out of court. If you want to go to court to make your case heard, don't count on it happening. It's all about expectations. Understanding what really happens in business law cases can save you a lot of money and frustration, help you select an attorney, or consider whether to take a case to court.